Curtains are an indispensable part of your home decor that add a dash of color and zing to your beloved abode. They also give you the required privacy that you need. While curtains have been used since time immemorial for protecting your house from the wind and sun, it is only recently that they are being increasingly used in home decor. The best part of curtains is that they come in a variety of colors and fabrics. From yellow to blue to red, you can get the color of your choice. Just keep in mind that the overall color of the curtains should match with the ambiance of the room where your curtain is placed. In the same vein, curtains come in a variety of fabrics as well. From pure cotton to satin and even silk, you will be spoilt for choice when it comes to choosing the fabric of your curtains. Here too, keep in mind that the overall feel and touch of the curtains should match with the setup of your room. 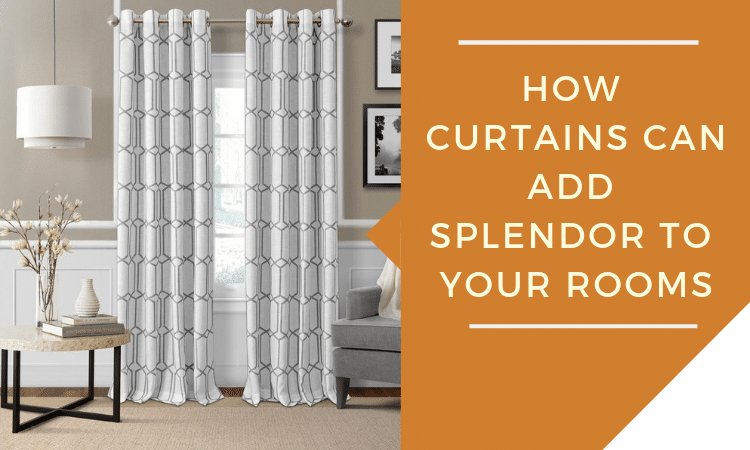 This article shows you how curtains can add splendor to your rooms. Here we discuss the different ways in which you can use the elegance and charm of graceful curtains to add veritable splendor to your rooms. After reading it, you will be in a much better position to embellish your rooms with an eclectic and resplendent look. You can easily procure these curtains from the best curtain shop in Kolkata. Read on to find the different tricks that will help you add a dash of pizzazz and splendor to your rooms. Different parts of your house should have different types of curtains. Obviously you cannot use the same curtain for the balcony and the living room. This is because the style and the ambiance for both these rooms are different. Hence, for balconies, you can use lace and chiffon as the chosen fabrics. This will help in allowing the daily dose of sunlight to come in and will also add an element of privacy to your dwelling. In this way, you get the perfect place to sip your evening tea. Many a time, it is observed that some rooms get way extra sunlight than the others. This can be a nuisance as you crave to have space where you can have some time for relaxing. For solving this problem, all you need to do is put some curtain blinds in the room with excess sunlight and enjoy the tempered ambiance for the entire day. Preferably you should use neutral colors for the blinds as it will help you blend in with the overall ambiance of flooded light. You can get these blinds from the window blinds shops. If your room has a sober, serene and tranquil environment, then it is best that you use brightly colored curtains in order to enhance the overall ambiance of your rooms. Using bright curtains will jazz up the room and will make it come alive. You can even mix and match the colors of the curtains in keeping with the colors used on the walls. Just make sure that all the colors blend with each other and there are no jarring elements. If you follow all the procedures mentioned above, then you will definitely ameliorate the complete look of your room by using brightly colored curtains. Some rooms get extra heat owing to the excess amount of sunlight that keeps entering the place all through the day. This is especially true in summer when the intensity of the sun is at an all-time high. For reducing this excess heat, you must make use of curtain liners. Curtain liners are thermal absorbent fabrics that are placed behind the curtains. They effectively block out the sunlight to a large extent and even help in thermal control. Using them also results in your curtains being more durable. Hence, you can definitely reduce the amount of excess heat in your rooms with curtain liners. If you want to add an element of refinement and sophistication to the room, then you must use metallic textures like copper and bronze in fabrics that are made of soft satin. This also helps in making your room look warm and welcoming to your guests and visitors. This is how modern window curtains can help in making your residence stand out from others by giving it a luxurious taste and feel. Kids’ rooms must be embellished differently than other rooms. This is because kids have an entirely different set of tastes and aspirations that are totally different from those of adults. They are not yet matured and want something that stimulates their mind and creativity. Hence, floral and cartoon prints are the best choice for children. This will keep them happy and energized all day long and provide them with a backdrop where they can carry out their activities uninterruptedly. It may even help you by keeping them restricted to their own rooms as they accept it as their personal space. You can add luxury and class to your living room in a very simple way. The patterns for your curtains should have heavily brocaded designs and they should be made of combing fabrics that will make your living room look lavish and opulent. In this way, you can easily add to the glamour quotient of your residence that will make it look truly exemplary. It will also make it truly memorable in the minds of your guests and visitors. This is one of the best living room window treatments. From the above, it is clear that curtains can add a high dose of splendor to your rooms. All you need to do is just follow the above-mentioned tips and guidelines to give your residence an unmatched look and feel.